LiDAR is an acronym for Light Detection and Ranging. A LiDAR system can rapidly transmit laser pulses in both day- and at night-times. The result is therefore a reflection of both landscape and man-made features. The known speed of light as well as the measured time interval of the laser pulses from transmission to return allows the determination of distances. An aerial survey can be performed either by a fixed wing airplane or by a helicopter installed with the LiDAR equipment including an Inertial Navigation System (INS) with gyros for measuring the platform vibrations and a GPS. Sometime this system is also called Airborne Laser Scanning (ALS). The result is an innovative tool for studying the ground and the surface. Applications are possible for hydrology, measurements of peat dome, extraction of tree height, estimation of Above-Ground Biomass (AGB), etc. A LiDAR survey provides data beyond that of a conventional survey with cameras. The eye-safe laser in the system has a very narrow beam called small-footprint LiDAR, which means that it can penetrate gaps in vegetation to reach ground through trees or other detail that is typically not visible from stereo imagery. This penetration allows for an accurate determination of ground levels in vegetated areas. The laser also reflects of above ground objects, giving positions and heights of power lines and power poles, high and low vegetation, buildings, bridges, fences etc., so building up a three-dimensional (3D) picture of the survey area. Due to the instrumentation in the LiDAR system that provides accurate position and attitude information for the laser points as well as an installed camera, very few ground control points are required, which means that accurate surveys are possible in inaccessible areas. These include quarries, wetlands, flood plane measurements, etc. The LiDAR data will be processed and afterwards be available with geo-referenced position for visualisation in a Geographical Information System (GIS). The LiDAR data overcomes the common Digital Elevation Model (DEM) by dividing it into a Digital Surface model (DSM) with buildings and trees and a Digital Terrain Model (DTM) the topography of the landscape. The tree height (h) can be obtained as follow: h = DSM – DTM. A LiDAR survey can be used for a wide variety of tasks, including the design of infrastructure such as roads, water canals, etc. The accuracy of the surface generated is approx. 15cm in elevation (z), ideal for agricultural planning, peatland research, river catchments surveys, flood mapping and mining survey. Eroded areas can be accurately surveyed, even through long grass layer. It is important to remember that there are different LiDAR systems on the market with the offer of different qualities. Normally the systems can measure up to 60 000-200 000 laser pulses per second at a mirror scan angle of up to 25 degrees either side of the vertical. 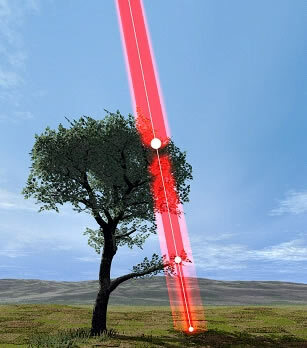 For each pulse they measure the first and last reflection, bearing in mind that each laser pulse can have multiple reflections if it strikes small objects like branches, wires or leaves suspended above the ground. The laser reflectivity or intensity value is also measured and stored with each reflection (Boehm et al. 2007). The INS measures the roll, pitch and heading of the aircraft at a rate of 50 to 400 times per second. Operating height ranges from 100m to 3000m above ground, resulting in variation of the swath coverage ranging from 70m to 2000m. These height ranges are different for the different systems. The LiDAR-systems are very mature nowadays. A small-footprint full waveform LiDAR (wLiDAR) collects with an average of 1 to 10 laser pulses per square meter for instance the PSF. This will be achieved by flying each transects several times. Different filters are available to identify the optimal solution to discriminate ground points from non-ground points reflected by the vegetation of the peatland. A terrain-adaptive bare earth extraction algorithm gives good results. This frequently used filtering algorithm (Kraus and Pfeifer, 1998) is based on linear prediction with an individual accuracy for each measurement. It is implemented as an iterative process. In the first step, a surface is computed with equal weights for all wLiDAR points. This results in a surface that lies between the true ground and the canopy surface. Terrain points are more likely to be below the surface and vegetation points above the terrain. The distance and direction to the surface is used to compute weights for each wLiDAR point using a weight function. The algorithm provides an unsupervised classification of non-ground features and adapts to the terrain condition. Furthermore, resulting ground points will be visually searched to eliminate outliers. - Boehm, H.-D.V., Rieley, J.O.. Limin, S.. Frank, J., Syafrudin M. (2007) Successful Helicopter Flight Trials with Airborne Laser Scanning Technology to measure PSF height and Peat domes in Central Kalimantan. In International Symposium, Workshop and Seminar on Tropical Peatland, “Carbon - Climate - Human Interactions - Carbon Pools, Fire, Mitigation, Restoration and Wise Use”, 27 - 31 August, Yogyakarta, Indonesia. - Kraus, K. and Pfeifer, N. (1998) Determination of Terrain models in wooded areas with airborne laser scanner data. ISPRS Journal of Photogrammetry & Remote Sensing 53: 193-203.